SORG Heating & Cooling, LLC is dedicated to providing the best possible solution for your home or business. You can count on us to provide you with a system and solution that fits your unique needs and since we have installed many systems in this area, we have earned a reputation for doing the job right the first time. We’ve been delivering quality services for furnace repair in Frankfort for many years, and we are the city’s leading Carrier Factory Authorized Dealer! We have a broad range of solutions to guarantee your heating and cooling system is in top-top shape and gives you the quality air you desire, all year round. As a factory authorized dealer, we have undergone detailed, rigorous, and strict training that makes us an industry leader in expertise, quality products offered, and competence in the HVAC business. Whatever you are experiencing with your heating and cooling unit, our NATE certified techs will ensure you get the care you need to return your space to comfortable indoor temperatures, even if it is after normal business hours! 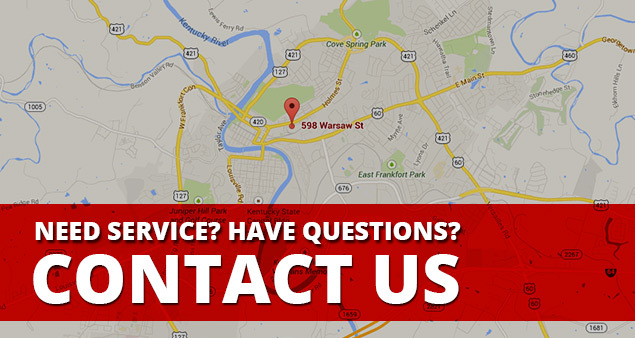 We offer the most advanced Frankfort, KY HVAC service and solutions – contact us today! As a family-owned and operated HVAC company, we offer our customers unmatched services for maintenance, installation, and heater repair in Frankfort Kentucky, along with the specialized attention you can only get from a family business. We always offer competitive pricing because we know our valued customers should receive unrivalled care with reasonable prices. We can help no matter what heating services you require! If you find yourself in need of furnace repair or replacement because you’ve been left without heat after hours – don’t despair! Our team of NATE certified technicians provide 24 hour emergency heating services. It’s probably time to replace your system if it is more than 10-15 years old. We are your local indoor air quality specialists, which means we not only ensure you have comfortable air for the duration of the year, but also make sure that the air you’re breathing is clean and contaminant-free. Call our trusted professionals today to learn more about our services for repair or furnace installation Frankfort residents always trust in times of need!